Starting from a reflection on the aims and learning outcomes of the undergraduate course on social research methods and an analysis of the entry level skills of students, especially related to the reasoning with number, this article illustrates the design process of the course in a blended format. In particular, we present the activities of translation, implementation and innovation of the logical and conceptual structure of quantitative empirical research in the e-learning environment. From our point of view, the use of the e-learning platform allows learners to overcome the difficulties that they usually have in the quantitative analysis of social phenomena. Catone, M. & Diana, P. (2017). Social Research Methods 2.0: e-learning design. 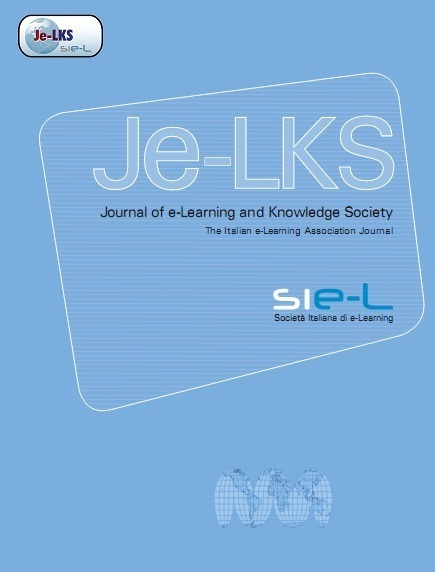 Journal of e-Learning and Knowledge Society, 13 (3),. Italian e-Learning Association. Retrieved April 24, 2019 from https://www.learntechlib.org/p/180978/. Andrews R., Haythornthwaite C., eds (2007), Handbook of E-learning Research, London, Sage. Bruschi B., Ercole M.L. (2005), Strategie per l’e-learning. Progettare e valutare la formazione on-line, Roma, Carocci. Calvani A., ed (2005), Rete, comunità e conoscenza: costruire e gestire dinamiche collaborative, Trento, Edizioni Erickson. Capogna S. (2014), Scuola, Università, E-learning: un’analisi sociologica, Roma, Armando Editore. Catone M.C., Diana P. (2015), E-learning to overcome the problems with the teaching of social sciences methodology, in: Falcinelli F., Minerva T.E Rivoltella P.C. (eds), Apertura e flessibilità nell’istruzione superiore oltre l’e-learning?Atti del Convegno SiremSiel2014. 142-144, Reggio Emilia, Sie-L Editore. Catone M.C., Diana P. (2016), L’esperienza del corso blended di metodologia delle scienze sociali: la voce degli studenti, in: Rui M., Messina L.E Minerva T. (eds), Teach different! Proceedings della Multiconferenza EMEMITALIA 2015. 379-382, Genova, Genova University Press. Corbetta P. (2003), Social research: Theory, methods and techniques, London, Sage. Dabbagh N. (2005), Pedagogical models for E-Learning: A theory-based design framework, International Journal of Technology in Teaching and Learning, 1(1), 25-44. Retrieved from http://www.sicet.org/journals/ijttl/issue0501/DabbaghVol1. Iss1.pp25-44.pdf. De Rossi M. (2015), Saperi pedagogico-metodologico-didattici, in: Messina L., De Rossi M. (eds), Tecnologie, formazione e didattica. 117-140, Roma, Carocci. Fedeli M. (2016), Coinvolgere gli studenti nelle pratiche didattiche: potere, dialogo e par tec ipaz ione , in: Fede liM. , Grion V. , Fr ison D. (eds) , Co invo lgere per apprendere. Metodi e tecniche partecipative per la formazione. 113-142, Lecce, Pensa Multimedia. Garrison D.R. (2011), E-learning in the 21st century: A framework for research and practice, London, Taylor& Francis. Jonassen D.H. (1994), Thinking Technology: Toward a constructivist design model, Educational Technology, 34(3), 34-37. Mannay D., Wilcock, C. (2014), What students want? Exploring the role of the institution in supporting successful learning journeys in online distance education. Widening Participation and Lifelong Learning Journal, 17(1), 49-63. Marradi A. (1996), Metodo come Arte, Quaderni di Sociologia, 40(10), 71-92. Meraviglia C. (2004), Metodologia delle scienze sociali. Un’introduzione, Roma, Carocci. Messina L., Tabone S., Tonegato P. (2015), Conoscenza sulle tecnologie, in: Messina L, De Rossi M. (eds), Tecnologie, formazione e didattica. 149-186, Roma, Carocci. Payne G., Williams M. (2011), Teaching Quantitative Methods. Getting the Basics Right, London, Sage. Ricolfi L. (1997), La ricerca qualitativa, Roma, Nuova Italia Scientifica. Scardamalia M., Bransford J., Kozma B., Quellmalz E. (2012), New assessments and environments for knowledge building, in: Griffin P., McGraw B., Care E. (eds) Assessment and teaching of 21st century skills. 231-300 , Netherlands, Springer. Schön D.A. (1987), Educating the reflective practitioner: Toward a new design for teaching and learning in the professions, San Francisco, Jossey-Bass. Williams M., Sutton C. (2011), Challenges and Opportunities for Developing Teaching in Quantitative Methods, in: Payne G., Williams M. (eds), Teaching Quantitative Methods: getting the basics right. 66-84, London, Sage.